When Antique collector Hagen Rayner’s uncle passes away he leaves Hagen his cherished Chicago home full of antiques but there’s a catch. Hagen has fourteen business days to find the deed to the house by following clues left behind by his Uncle. If he fails the house will be passed on to his cousin Dag who plans to sell the house and its contents to support his failing business. The only help Hagen will get on his search is from Uncle Birger’s much younger friend Maeve Delaney. Maeve Delaney knows that Birger’s family doesn’t trust her. They think she’s a gold digger that targeted Birger and she can clearly read the hostility in their eyes. Being an expert in making people disappear, her first instinct is to run but Hagen finds her in the nick of time and begs for help. Together they begin the search but can they find the deed in time with the obstacles Dag throws in their way? Now this is what romance writing should be. 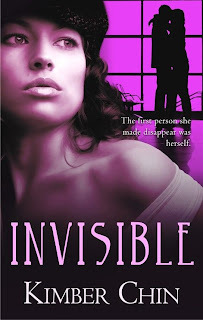 Last year’s Breach of Trust was winner in my book and I was eagerly anticipating Invisible. Kimber Chin lived up to the expectation and gave us another hot story. Hagen and Maeve are remarkable characters with exceptional chemistry. The storyline was completely believable and I was quickly engrossed in the search by the first few chapters. This is a must read for romance lovers. Love stories about antique stores or collectors. My grandmother owned an antique/ flower shoppe when I was a kid.